Now for sale in our Houston showroom is this super awesome sleeper 1969 GMC 1500. Between the clean look and the aggressive powertrain, this is a fun truck. Under the hood of this classic square body is a Weiand supercharged 350 CID V8 engine putting out quite a bit of power. Topping the Weiand blower off is a four-barrel carburetor fitted with an Edelbrock air cleaner. The engine also features Edelbrock valve covers that accent the air cleaner nicely. Sending that boosted power to the rear end is a turbo 350 three-speed automatic transmission that shifts crisply through the gears. Providing cranking power to that big V8 is an Optima Redtop battery for added reliability and power over a traditional lead-acid battery. Sending the exhaust gasses to the rear of the vehicle are stainless steel headers. When it comes time to stop this big truck, the driver will appreciate the power brakes. Moving outward, the truck maintains the sleeper look with original styling. The body is finished in an olive-green paint that is in decent condition. The chrome bumpers and appropriate trim are in good condition also. Supporting each corner of this large truck are steel wheels with polished accents. The bed is covered by a white vinyl cover that is in good condition. Wrapped around those wheels are Firehawk tires with white lettering and good tread life left in them. Upon entering the vehicle, the driver will notice the two-tone green finish. The bench seat is finished in dark green vinyl and is in good condition. Providing comfortable and easy maneuverability is power steering. Overall the truck maintains a very minimalistic feel with some basic amenities and an awesome powertrain. To see all the HD pictures and video, please go to http://www.gatewayclassiccars.com/HOU/1104/1969-gmc-c10. For even more information on this 1969 GMC C10 located in our houston showroom, come by and see us or contact the showroom at (832)243-6220, or email the showroom at houston@gatewayclassiccars.com. For sale at Gateway Classic Cars in our Saint Louis Showroom is a unique opportunity to own a celebrity car, a 1989 Bentley Turbo R owned by Ryan O Neal who was also Farrah Fawcetts boyfriend until her last days. Originally priced new in 1989 at $156,000, this is a timeless classic that will always turn heads. Calculating inflation that is 300,222 dollars today! The Bentley Turbo R has many high-profile followers and remains one of the few new cars Jay Leno has ever purchased! The Bentley was full of cutting edge technology paired with classic styling. Features like hydraulic self-leveling system and enlarged anti-roll bars make this luxury car a hybrid sports car. The Turbo R model offered a 6.75L V8 engine, paired with a turbo produced 487ft-lb of torque! Yes it is heavy but its also fast. Over 6000 lbs, this car is capable of reaching speeds up to 137 mph. The Turbo R received anti-lock brakes and new Bosch MK-Motronic fuel injection to replace the Solex carburetors. It made a large difference in year round performance and reliability. This Bentley is painted in classic Tuxedo Black and offers rich black leather interior with natural wood accents. The handcrafted wood accents are nothing to shake a stick at. It takes about two weeks to prep the luxury wood for use, during which time the veneers are given five coats of lacquer and three days to cure prior to being wax polished by hand. The veneers retain their natural rich coloring, as Bentley uses no bleaching on the rare woods. Opening the rear door of this sedan youd swear it was a new Bentley. When you close the door is sounds and feels as solid as a British tank. The car also offers alloy wheels for added performance. They are chrome plated of course. We have a picture showing Ryan and Farrah, enjoying this vehicle. Own a piece of history if you were a fan of Farrah Fawcett, Ryan O Neil, Chalries Angels, Love Story (1970), Whatâ€™s Up Doc (1971), The Thief Who Came To Dinner (1973,) Paper Moon (1973), Barry Lyndon (1975), Olivers Story (1975) andIrreconcilable Differences (1984). The Ryan O Neal and Farrah Fawcett is a true love story. Options include: automatic sunroof, self leveling suspension, A/C, power steering, power brakes, power windows, power locks, AM/FM/Cassette, fuel injection, alloy wheels, leather interior, turbo aspiration, and more. To view the car in greater detail, including an HD video of the car running and driving and 100+ HD pictures, please visit www.gatewayclassiccars.com. If Jay Leno owns one, you know its a good car to hold on to! Enjoy the memories of this Hollywood couple, when you own this car. Call 618-271-3000 for more information. Now for sale in our Houston Showroom is this powerful 1990 Chevrolet C1500 454 SS. This classic truck was the must haves of its generation and still desired by many today. With less than 17,000 total trucks built between 1990 and 1993 these are becoming rarer as time goes on. This pickup is powered by a stout 454 CID V8 which was rebuilt in March of this year by “Rolem Auto Service”. The engine has only around 700 miles on it since the rebuild and runs strong. They also installed a new camshaft, new plugs, brake booster line, water outlet and thermostat, and rear brake shoes and cylinders. This truck is ready to hit the road and has many years left in it. The truck is sprayed in Onyx Black which was the only color option for 1990 on this truck. Walking around the truck you will find a few minor blemishes as the truck is 28 years old after all. The interior is also a single color for the year in a sleek Garnet red and is in great condition. The truck features the comforts of cold blowing A/C which is a necessity for most. The truck also features power steering, power brakes, power windows, and AM/FM radio. For more information on this 1990 Chevrolet C1500 454SS for sale, to see all the HD pictures and videos of it, copy the URL below, and see it at this direct link: http://www.gatewayclassiccars.com/HOU/1300/1990-Chevrolet-C1500 . Alternatively, if you want to see it in person, come to our Houston Showroom, located at 1910 Cypress Station Dr, Bldg 200, Houston, TX 77090. You may also call the showroom at (832) 243-6220, or email us at Houston@gatewayclassiccars.com. 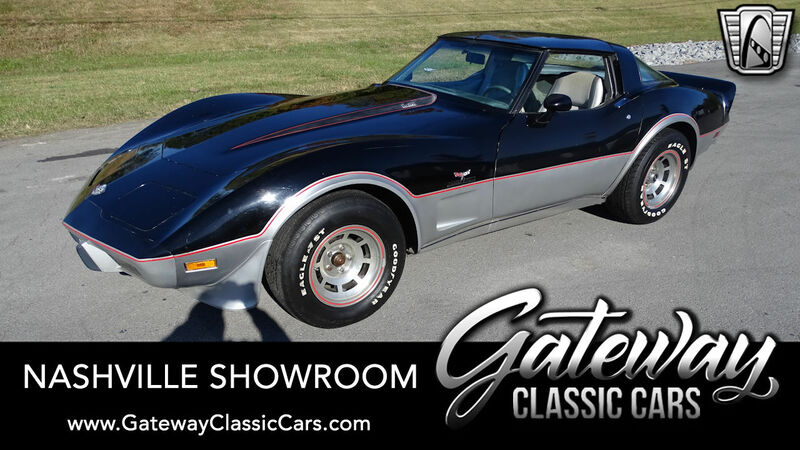 Gateway Classic Cars is proud to offer for sale in our Detroit showroom this beautiful low mileage 1978 Chevrolet Corvette Silver Anniversary. 1978 marked the 25th model year of this legendary sports car and with the styling of the ’78 you can see why it has reached the quarter century milestone for running production. 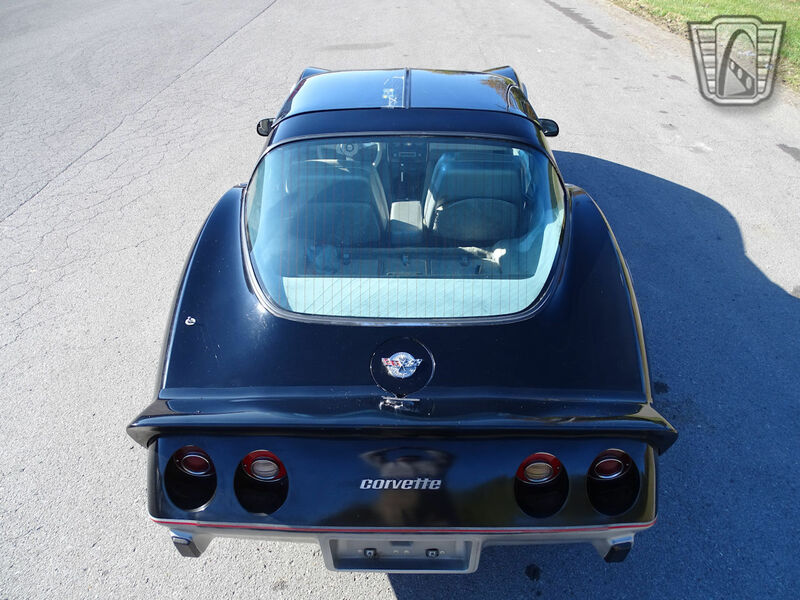 This numbers matching Corvette is powered by the legendary L-82 350 Cubic Inch V8 engine and having just 1,708 actual miles on the entire car, this Corvette has been extremely well taken care of and is a perfect addition to any collector’s garage or display. The two-tone metallic silver paint shows very well and the gorgeous Oyster interior absolutely pops in the sun. The painted t-tops are kept safe in their factory leather pouches when you want to cruise while basking in the sun. 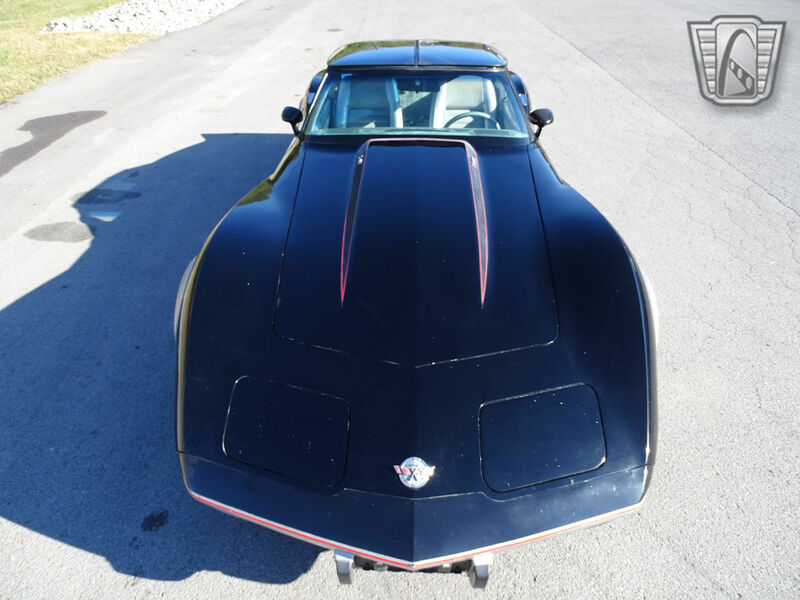 This Corvette was built and optioned out to make cruising or pavement pounding fun and easy for just about everyone with its power brakes, power steering, and cruise control. They say you dont get into a Corvette, but you fall into it, well with one look you will absolutely fall for this one! 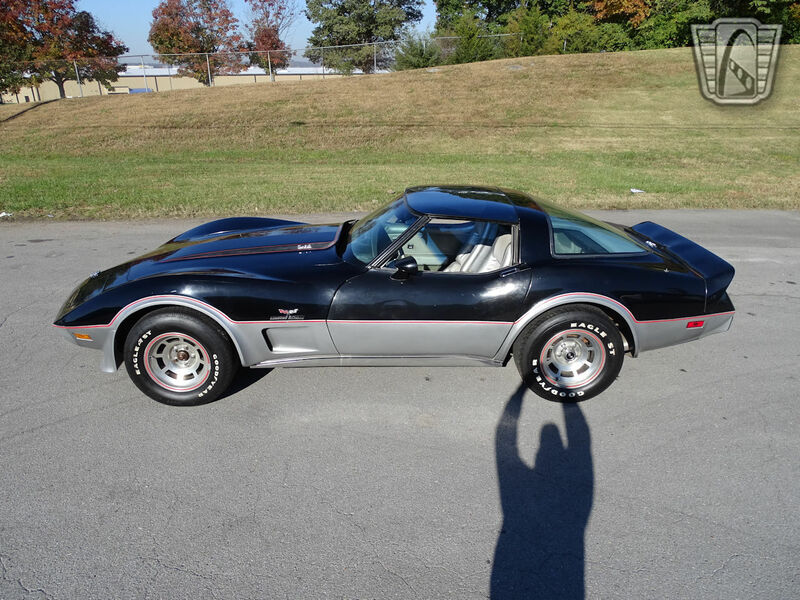 Options on this 1978 Chevrolet Corvette Silver Anniversary Edition include; Air Conditioning, AM/FM Radio, Painted T-Tops, Cruise Control, Power Brakes, Power Steering, Power Door Locks, Power Windows, Tilt and Telescoping Steering Wheel, Seat Belts, and Radial Tires wrapped around Rally Wheels. For more detailed pictures and a great HD video of this car please visit www.gatewayclassiccars.com. For more information please contact one of our friendly and knowledgeable staff at 313-982-3100. Gateway Classic Cars of Scottsdale is proud to offer this beautiful 1997 Chevrolet Camaro convertible Z-28 30th Anniversary edition. This 1997 Chevrolet Camaro Z-28 30th Anniversary edition is in time capsule condition and has only traveled a low 27,058 miles since it was new and its. Originally from California, this beauty sports all its original paint and interior, the top is the same one it left the factory with two decades ago. Now this may make you think it’s time for a new top but do not be mistaken this is truly is like going back in time and purchasing this car new. The top is soft as fresh vinyl. This 1997 Chevrolet Camaro Z-28 30th Anniversary edition features the powerful General Motors 350CID V8 LT-1 engine with a gear bragging automatic transmission that was built to be a neck snapper. While interior is loaded with all the goodies packed full power accessories, driving this limited-edition Camaro is exhilarating and great fun. Because this car has always been owned by a car enthusiast, the care given by each owner has preserved this car in this amazing condition. This 1997 Chevrolet Camaro Z-28 30th Anniversary edition has been taken care of and loved so much that the engine compartment and the undercarriage have both received a full and authentic detailing, and the air conditioning blows ice cold. Less than one thousand of these commemorative Camaros were ever assembled for the 1997 model year making this a very sought-after vehicle. This one is sure to appeal to even the fussiest enthusiast and can be thoroughly enjoyed while also appreciating in value, if proper care is taken. To see 100-plus pictures and a video of this 1997 Chevy Camaro Z28, please visit www.gatewayclassiccars.com. For more information or to schedule an appointment to view this vehicle in person, please call the Scottsdale showroom at 623-900-4884 or email us directly at scottsdale@gatewayclassiccars.com. The Pontiac Firebird was launched in 1967 along with the Chevrolet Camaro to compete with the Ford Mustang. The name “Firebird” was previously used on several concept cars in the 1950’s and 1960’s. In March 1969, a $725 optional handling package called the “Trans Am performance and appearance package WS4”, named after the Trans Am race series, was introduced. During its 35-year production run, the Firebird name plate has become one of the most recognized in the world. 1979 marked the 10th anniversary of the Trans Am. The model saw a restyled front end and a record sales year. This white/cream classic is an unrestored, unmolested beautiful survivor. Standard equipment includes power brakes, power steering and leather interior. Turn the key, feel the rumble and gaze out over the hood with its iconic “shaker” style and you will be taken back to 1979 in a hurry! This Pontiac Trans Am is located in our Milwaukee showroom. You can view the 1979 Trans Am in greater detail including HD retn HD video of it running and driving at Gatewayclassiccars.com. If you are interested in purchasing this vehicle or have more questions regarding it, please call us at (262) 891-4253 or email at Milwaukee@gatewayclassiccars.com. Amazing incoming visitors at our Milwaukee Showroom at Gateway Classic Cars, sits this gorgeous jet black 1979 Chevrolet Corvette. 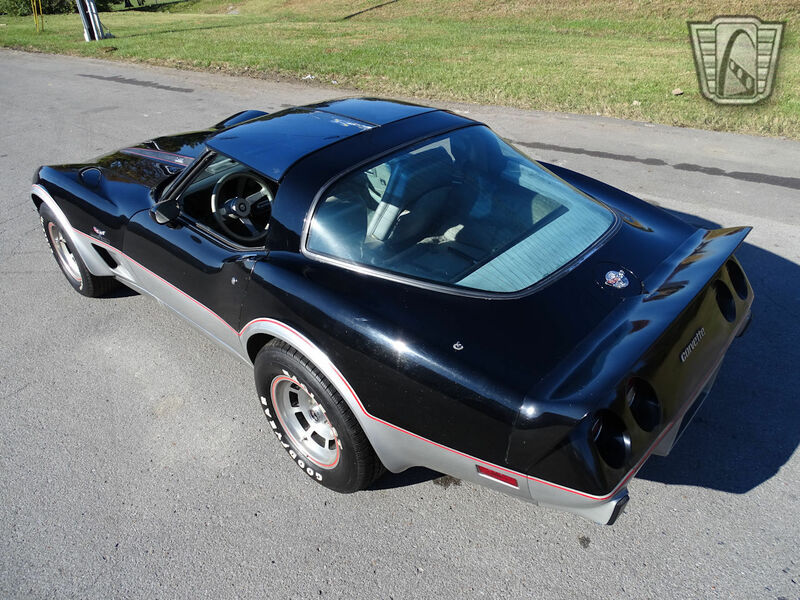 While some of the C3 Corvettes may fluctuate in value and in quality depending on the original equipment, this one is a shining example of a better built version built at the end of the 1970â€™s. This is evident by the desirable L82 350 cubic inch V8 under the hood in place of the less powerful L48; which is the difference of a 170 hp to a 210 hp engine. On top of having the better option, this car features a 4-speed manual transmission making it the ultimate version of the Corvette offered of this year range. But previous owners decided that having an awesome drivetrain wasnâ€™t enough and decided to add a Bluetooth stereo with a custom back rack style rear speaker would be cooler. Then paired with futuristic looking digital gauges all around with the ever-desirable T-Tops; this car proves to be much more than just another Corvette with a beautiful glossy black exterior appearance. This beauty also features power steering and a/c which makes any cruise much more enjoyable at a moments notice. 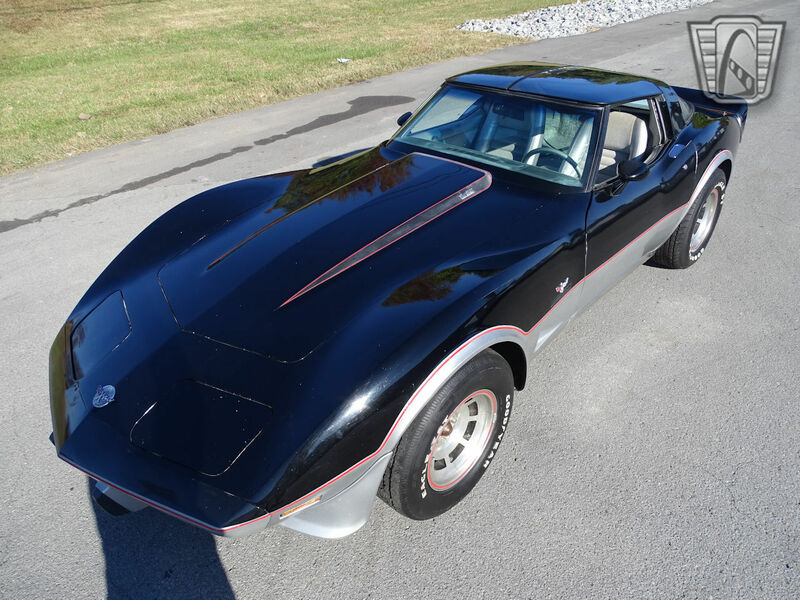 This 1979 Chevrolet Corvette is available at our Milwaukee Showroom at Gateway Classic Cars and can be seen at www.GatewayClassicCars.com which includes 100+ HD photos and HD video. To see the car in person, it can be seen at our Milwaukee Showroom located at 9949 58th Place Suite 400, Kenosha WI 53144. Any and all questions can be answered by our knowledgeable staff by calling (262) 891-4253 or email us at Milwaukee@GatewayClassicCars.com. The Atlanta Showroom is offering this 2015 Harley-Davidson FLHXS Street Glide. The Harley-Davidson Street Glide features the Batwing fairing with Splitstream vent, stripped down styling, and lowered suspension. It also is equipped with a dark, cropped wind deflector, integrated oil cooler and a Six-Speed Cruise Drive transmission with integrated Isolated Drive System (IDS). The Harley-Davidson Street Glide has air-adjustable rear shocks, full-length rider footboards and also the electronic cruise control. For the 2015 and 16 season, CFG charities, Inc in a project with the Atlanta Falcons, Budweiser, and other local companies agreed to build a custom Atlanta Falcons 50th Anniversary Harley Davidson. Seller states this Hog was given a $10,000 custom paint job, no decals, all the paint is hand done by Chattanooga Customs and a chrome upgrade, based on renderings from noted Michigan Harley artist VonButch and approved by the Falcons and the NFL. This is a true one of a kind for the biggest fan. This bike also includes images from the Falcons, a VonButch souvenir flag and two nice helmets. Make a statement with your Harley, cruise with a true one of a kind. To view the car in greater detail, including 100+ HD photos and HD video, please visit www.gatewayclassiccars.com. For more information please call the Atlanta showroom at 678-894-4833!